AURORA, Ill. (WLS) -- Three people have been charged after a five-hour standoff in Aurora, police said Tuesday. 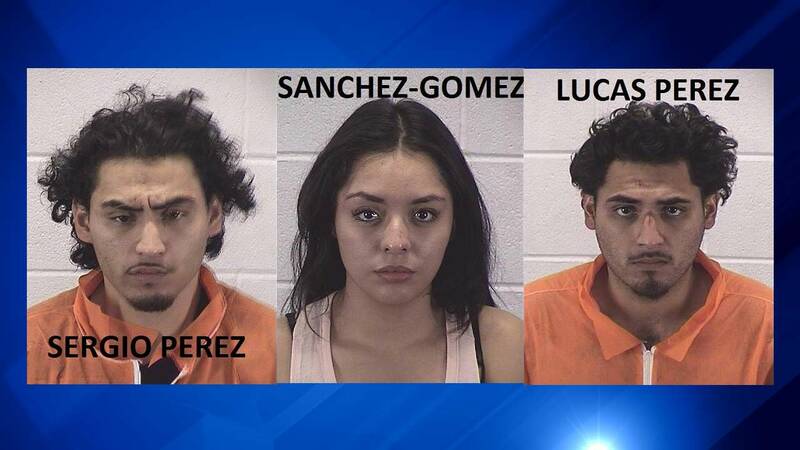 Two brothers, 25-year-old Sergio Perez and 24-year-old Lucas Perez, both of Aurora, have been charged with armed violence, unlawful use of a weapon by a felon, two counts of residential burglary and a single misdemeanor count of resisting police, police said. Claudia Sanchez-Gomez, 22, also of Aurora, has been charged with felony obstructing justice. Police originally responded to a burglary call around 6 p.m. on Saturday after neighbors called 911 after seeing two men exit a gray Honda Accord and act suspiciously, attempting to kick in the back of the door of a house near Western Avenue and Marseillaise Place. Police spotted the Honda driven by Gomez with a woman from Big Rock as a passenger and detained the two women while other officers entered the home and heard the two men inside the home. Police contacted the homeowner, who told police he had a large cache of weapons inside the home. After the two men refused to leave the home, a SWAT team was called in and closed area streets, police said. The suspects broke windows and pointed guns at police during the five-hour standoff, police said. At one point, Lucas Perez pointed a shotgun at a group of officers, who fired at the suspect but did not hit the suspect, police said. Police fired tear gas into the home and the two suspects surrendered around 11:10 p.m. Both brothers were treated at an Aurora hospital for multiple cuts to their hands. No officers were injured. Gomez's passenger in the Honda was released without being charged. Police believe the three people were probably involved in a home burglary between 8:40 a.m. and 5:30 p.m. Saturday in the 200-block of South Randall Road. A computer, jewelry and other items worth about $3,000 were taken from the home, police said.